"Assistant General Secretary Paul Talbot, Head of Legal, reported that of the 5 (Unite) officers so far identified, only one is worthy of further investigation. Joint General Secretary Tony Woodley asked Paul Talbot to carry out further investigation. 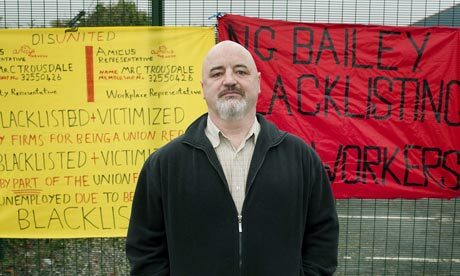 "It was reported that Jim Simms of Beaver Management Services Limited (BMSL) had made statements that union officers were complicit in the Blacklisting of members, one at a public meeting during the TUC (Conference) week and another under oath at a Tribunal. Joint General Secretary Derek Simpson said the Legal Department would write to Mr Simms asking him to substantiate these remarks or refrain from making them in future." Mr Simms is not the first employer to raise concerns about the role of former Amicus union officials in the use of the blacklist in the British construction industry; Alan Wainwright, in 2004 a Regional Production & Resources manager for Haden Young a subsidiary of Balfour Beatty PLC, began a whistle blowing campaign against blacklisting in the construction industry. In a letter in 2006, he expressed doubts about an Amicus official in the Midlands and he wrote to Derek Simpson, then the General Secretary of Amicus: 'I cannot believe that after over nine months now being in possession of the blacklisting information, that this union is not asking Balfour Kilpatrick why the lists (blacklists?) of names were forwarded .... and .... circulated ....' On the 6th, July 2006, Mr Wainwright in a letter to Derek Simpson wrote: 'I therefore do hope that you will now take this opportunity to take a more proactive approach to establishing the true facts from your staff and more importantly, take action to ensure the matter is fully investigated and eradicated from the industry for good.' It seems that despite Mr Wainwright's best efforts that we are still awaiting the Utopian dream of a blacklist-free construction industry and if Derek Simpson has his way the union renegades who helped enforce the blacklist will get off scot-free. Dear All, I, as you all, am well aware that they don't care about you, their staff, or their customers. They in fact, DON'T EVEN CARE ABOUT THEIR BBY SHARE HOLDERS. Parasitic interests have hijacked the firm and are running it into the ground by design, whilst lining their pockets as they do so---via fraud, bribery and money laundering. Please take some time to see how this technically makes them a Ponzi Scheme. You may be interested in looking at their insurers, with them requiring heavy financial backing to support their large infrastructure projects. See the: Madoff Precedent---US & Internationally accepted law; US Patriot Act; &, UK Bribery Act, with it's general, internationally reaching criminal implications for all financial crime, wherever it happens. BBplc is based in the UK, and it trades on the stock market as BBY. Please feel free to contact me at any time with regards any of what I have said or posted here. If you are dissatisfied with BB, then please go further than lodging a complaint with them, as this facility is designed not to have any effect. Your dissatisfaction will be shared by the investors, who have no interest in this long-established firm being plundered, just as they will have no interest in them being given a terrible reputation in the USA, as this is bad for the business, and will not make them money---as they know too well, their shares keep going down under their current regime. I am happy to assist you in any efforts that you might have to bring their decietful, poor practises to light. Than you, Tom Cahill Victim of BB fraud and witness to much greater fraud on a project in Malaysia, which the BBplc HQ in London conspired to promote, against the company's interests, and that of the shareholders.